Yes, I know. Do you really need another top ten list for writers about the things you should have at your fingertips? Of course you need a laptop and printer ink. A dictionary and thesaurus. Probably Strunk and White. But this list is very personal. These are the things that make me happy both when the story comes easily and when it doesn’t. So, while it’s not completely original, maybe you’ll see your favorite or discover a new one? 10. 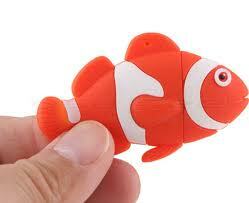 A Clown Fish Flash Drive – Okay, so here’s the deal. I just saw this today while we were school shopping and I didn’t buy it. But it inspired this post. And I must have it! Must! There is a hen flashdrive too! So, I’m going back tomorrow and probably by the time you read this post I’ll be very ecstatic owner of both these flash drives. Do not be jealous—you can buy them for yourself. 9. Wilson Jones Big Mouth Files – Each manuscript has its own Big Mouth with drafts and research and, well, everything that I scribble on little sheets of paper. I just ordered a bunch more of these on-line. Love ‘em! 8. Lots of writing utensils. — Pens, pencils, a sharpener. Preferably including some wild colors. If one utensil isn’t channeling your muse switch to another and another and another. Mine has moody days every so often and that’s when I pull out the heavy artillery—a Sharpie. Tell me, who can resist the feel? The smell? Not me or my muse. 7. A Flip Dictionary – I learned about this from a friend in my critique group and I’m eternally grateful to her. Thank you Nicole Cabrera! So here’s the scoop. It’s not a thesaurus—exactly—but it’s similar, kinda. It will help you find the term or word that’s eluding you. It might even get you thinking of a whole new story to tell. I just can’t emphasize how totally awesome it is. 6. My children – What they say and do is a constant source of inspiration. Enough said. 4. Books about writing – I have an entire shelf dedicated to these, plus a file on my Kindle. Yes, of course, I have Strunk and White but prefer Stephen King’s On Writing or Robert’s Rules of Writing by Robert Masello. 2. My library – for many, many, many reasons. 1. Books in print and especially on my Kindle – When I think back on my AHA! Moments, they all came reading someone else’s writing. A skill—like voice, for example—never sunk in until I was curled up with a book and then…Voila! It suddenly made sense. Those moments used to come while reading printed books but now more often than not it’s during an e-book. Yep. that’s right. I’ve become a Kindle convert. And here’s another confession: I was given my Kindle as a gift and refused to read anything on it for six months. Then when I finally I did, I was hooked. It’s now loaded up with well over one hundred books. I carry it everywhere. So that’s my list of items that inspire and support my writing. What’s your favorite? Anything that I should run out and buy? Um, after the Clown Fish Flash Drive or another spiral, that is. August 25, 2011. Tags: silly, writing tips. Uncategorized. Now I don’t feel so bad! When I finished picking up the kids’ school supplies yesterday, I threw a couple of things in the cart for me, too! A pretty binder to keep everything related to my WIP in, and some cool pink gel pens. Thanks for sharing Michelle. I’m going to get a Flip Dictionary ASAP! August 25, 2011 at 1:20 pm. Permalink. I LOVE that Flip Dictionary. I could write an entire post on how I can’t do without it. In fact, I may. Thanks for the inspiration. August 25, 2011 at 2:16 pm. Permalink. Kristina, Hurray for princess gel pens! Augusta, So nice to meet another Flipper! And ooh, what’s Scrivener? I’m off to Google now! August 25, 2011 at 2:35 pm. Permalink. Yup, Flip Dictionary is the bomb! I can’t do without my candles, either. One scent for each book and it must be burning or I can’t write. Weird, I know. Heard great things about Scrivener, but I have yet to take that plunge. Thanks for the great post, Shel. August 25, 2011 at 8:09 pm. Permalink. Where did you get that flash drive?!? I need a new one, and why not get a cute one? I’ve never even heard of Flip Dictionary, but it sounds awesome. August 26, 2011 at 5:35 pm. Permalink. Where did you find the fish drive? Looking online, I find a less-cute one in stores everywhere, but not the one you saw. August 26, 2011 at 5:36 pm. Permalink. I found the flash drives at OfficeMax right near the register. 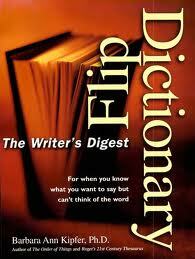 And definitely check out the Flip Dictionary. Don’t know what i did without it! August 26, 2011 at 6:07 pm. Permalink.